Big Boys: the tools that are really expensive, or take up alot of room! First up… the nylon faced bracelet former pliers! I considered these pliers a “cool tool” for many years, but over the years, they’ve become part of my “must have” toolset (yes – they are still really cool!). 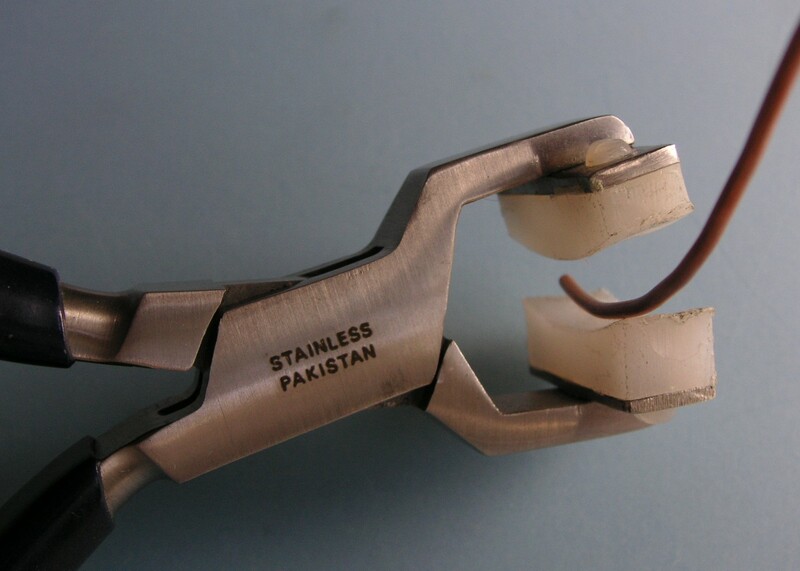 These pliers have nylon jaw pads that are shaped to easily bend thin metal and wire in a light consistent curve. One side is convex, the other concave, so that they fit together when closed. 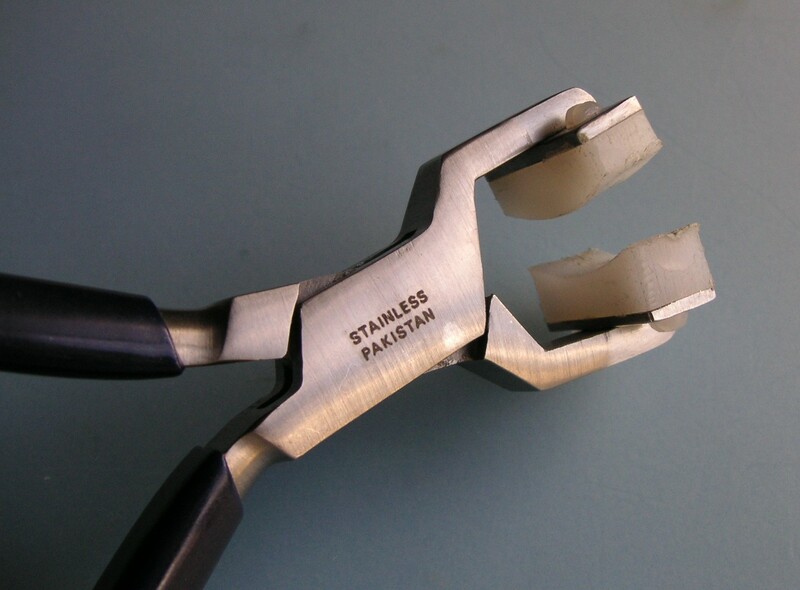 Many of these pliers have replaceable nylon pads so that when you ding them up (and you will!) you can easily fix them – note the nylon screws that are holding them to the jaws. These pliers are great for shaping both narrow strips of metal sheet, as well as wire. 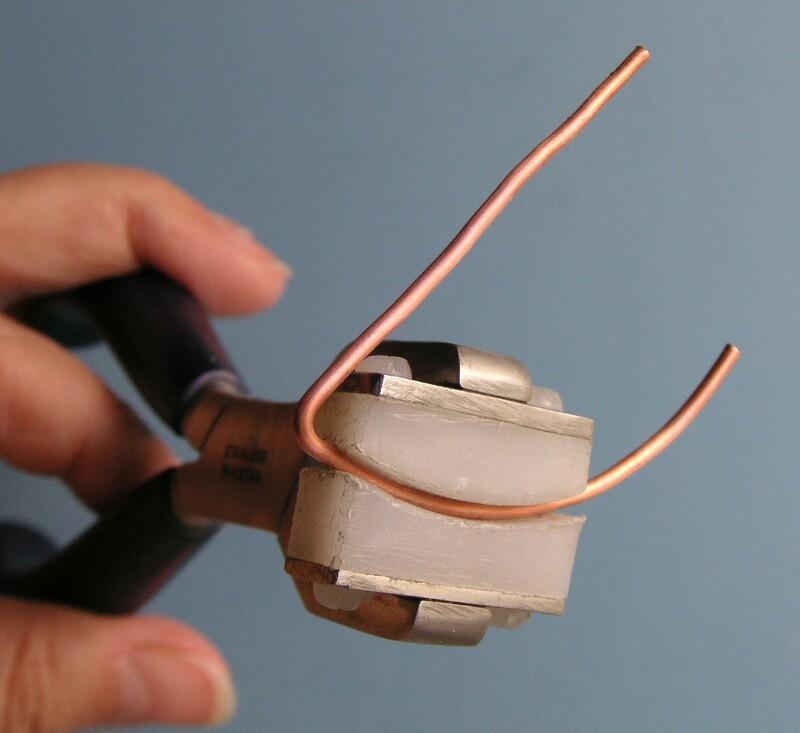 I can easily shape up to 12g – for reference, the copper strip above is 16g, and the wire is 14g. And using them is so simple – it doesn’t get any easier! So simple, and the results are so clean and nice and consistent! 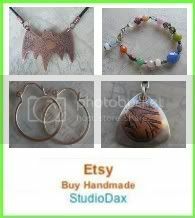 You can easily shape wire for a bangle, or to create a “frame” which can be hammered and wrapped. 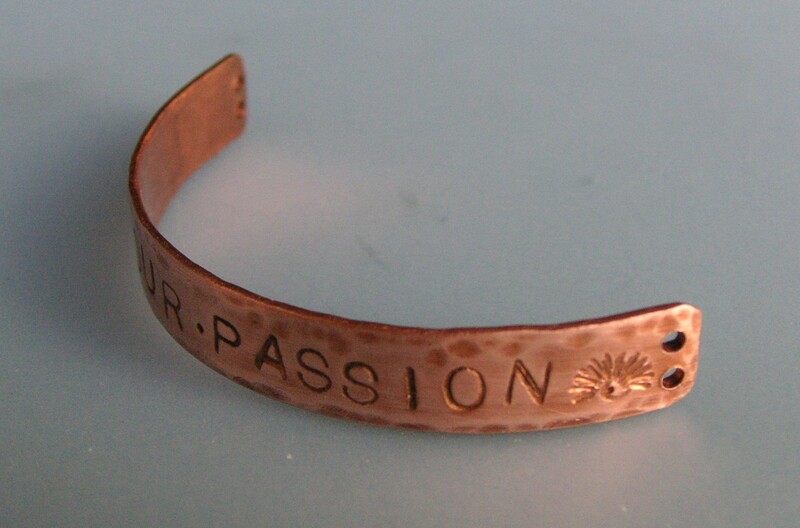 For this piece, I had already finished the copper strip design with some letter stamping, texturing, and hole punching. I am going to use it as a link for a bracelet… look how easily it gets formed! Doesn’t this look great?! Nice and even, with no warping or damage, and the nylon ensures that the strip doesn’t get scratched. 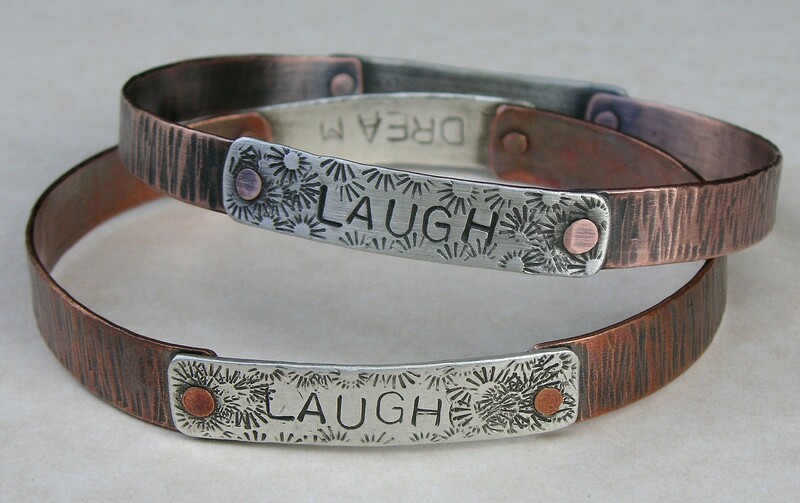 I am planning on antiquing the copper to bring out the details, and will add some chain, or maybe attach some leather cord, to make up a bracelet. 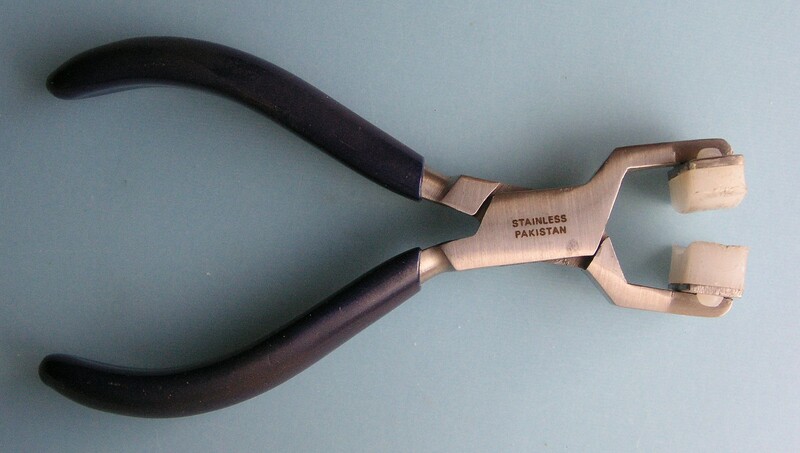 Hopefully… I’ve shown reason why this pair of pliers has moved into my “Must Have” list – I have a few pairs with slightly different shapes – all of them are well loved! I’ll be posting more photos of my favorite tools, as well as some info on how they are used – let me know if there’s anything is particular you’re interested in, and I’ll try to oblige! I enjoy doing custom work – but I hate when I mess it up! 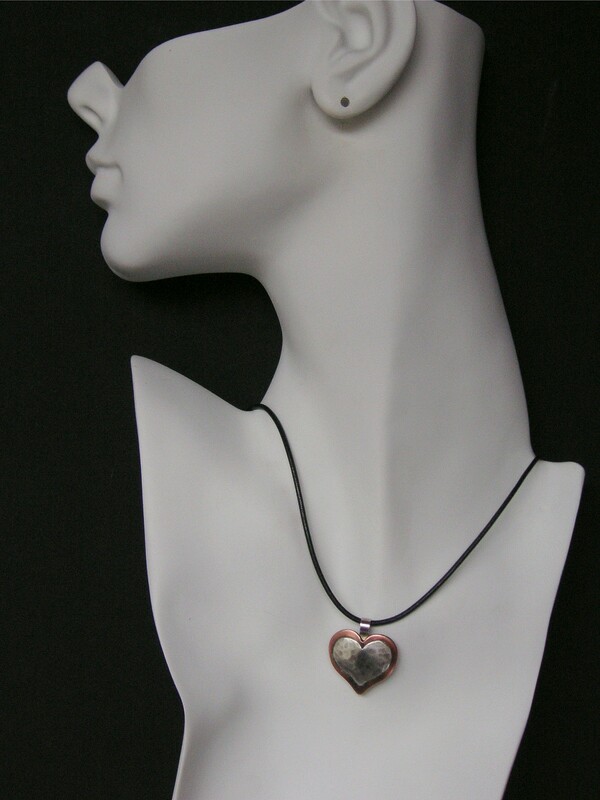 A few months ago, I made a simple heart pendant with the name of a friends daughter stamped into the surface. 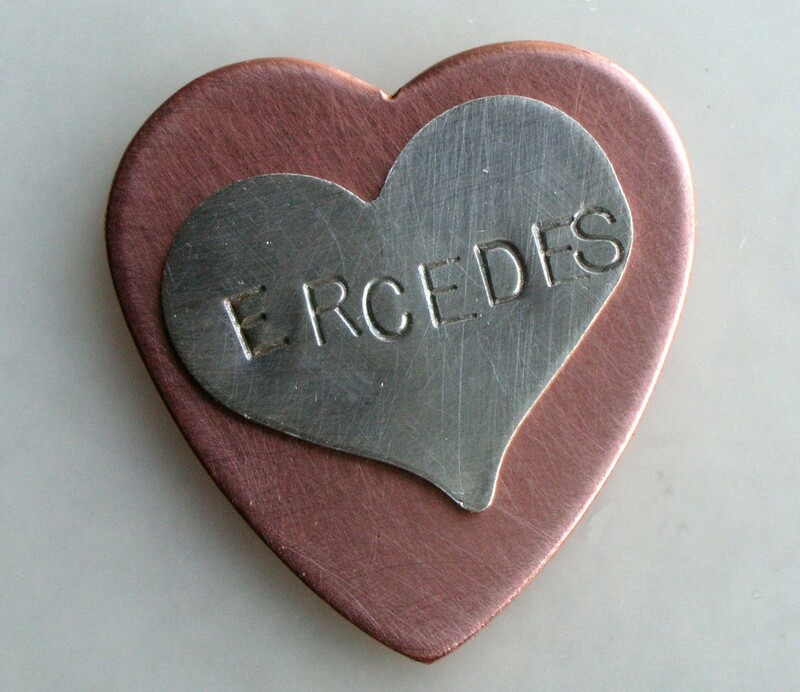 I started in the middle to center the name, and worked outward, but unfortunately, I messed up the next to last letter by stamping it too far away, and not leaving me room for the last letter – so poor “MERCEDES” wound up “ERCEDES” on my first try! I eventually created another one (which came out just fine! ), and just threw this into my recycle pile. 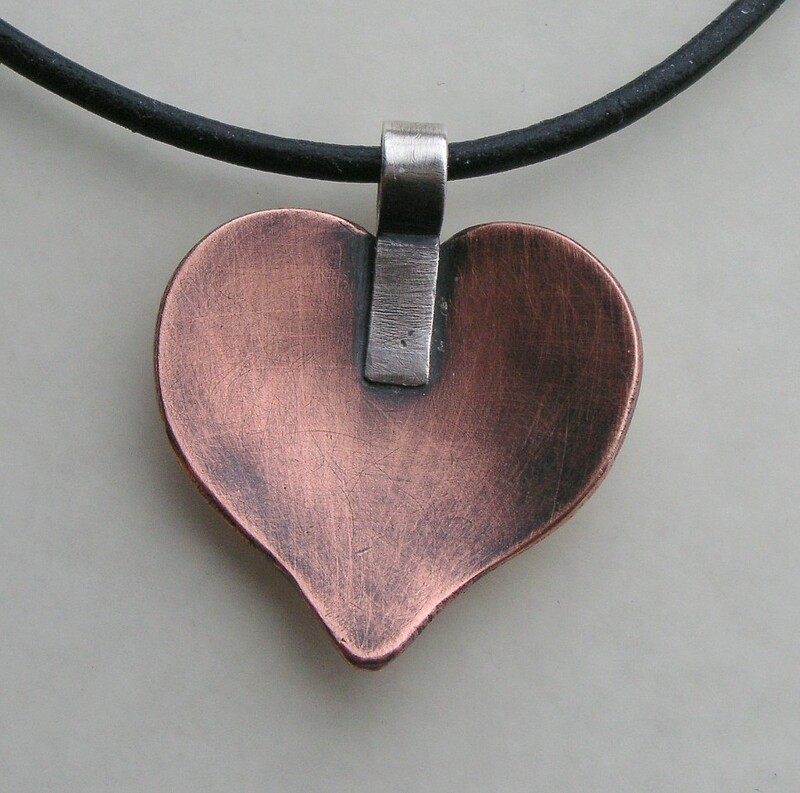 But I’d much rather reuse, than recycle, so in the back of my mind, I had the idea to rework it with a copper heart, but I wasn’t too sure what to do. 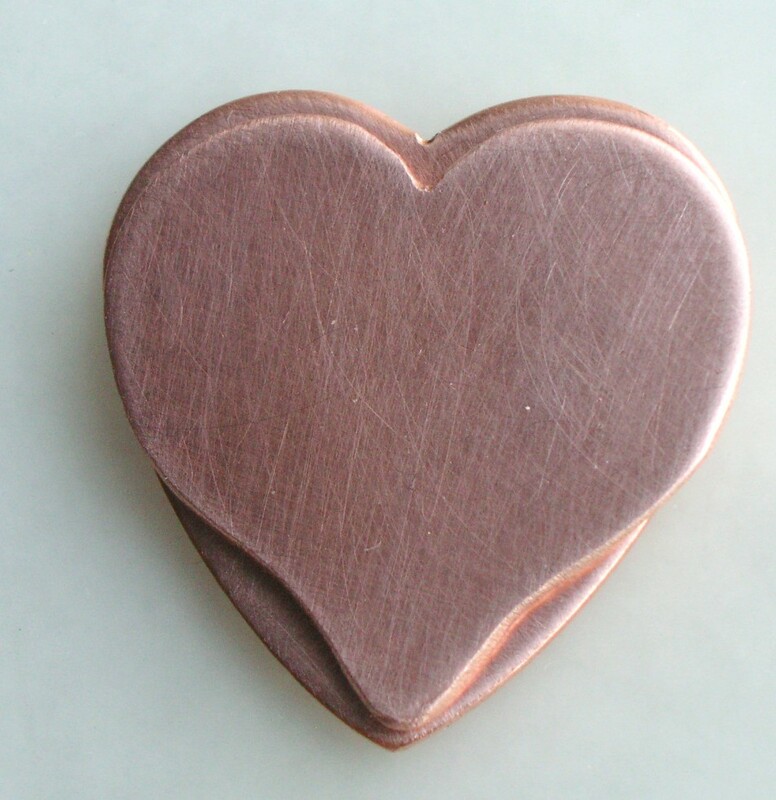 The first thing I realized is that I had to reshape the copper heart to be closer to the shape of the silver one. So I traced the heart, and did a bit of grinding and sanding to make the heart more rounded, like the silver shape. You can see how I reshaped the bottom to make the sides a bit rounder, and I filed the separation at the top, to exaggerate the shape a little. 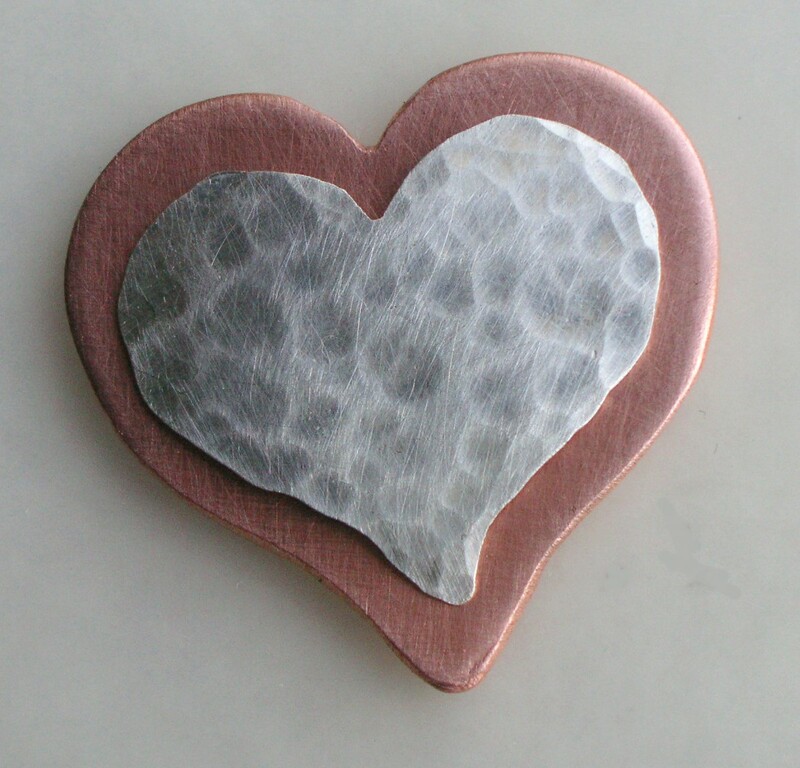 Once I got the copper done, I needed to do something to the silver, and I decided to do a simple texture using a polished ball pien hammer, working on the back, Once the texture looked good, I laid it on the copper heart, to see how I wanted to proceed. Not bad…! I really like how the copper base highlights the textured silver, and although I originally thought I’d drill some holes on each side and add jumprings, instead, I think I’ll make a bail in the center. I was also going to rivet the 2 hearts with some brass rod, but I like the solid look of the silver, so I’m going to just solder it up instead. 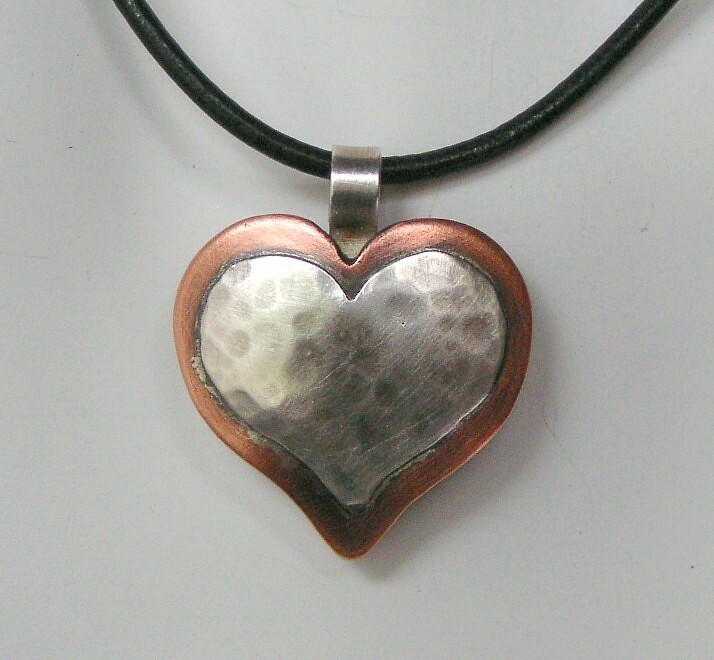 I did a simple sweat solder join between the 2 pieces by just soldering the back of the silver heart, then laying it over the copper heart, and reheating. Unfortunately, I was concerned that I wasn’t making contact across the whole disk, and I reheated it a bit too much – you can see how the solder flowed out the edges on the sides (sorry I didn’t take a photo before I antiqued it!). I also curved the hearts before soldering them together, so that I didn’t warp the top silver disc, and added a center bail. 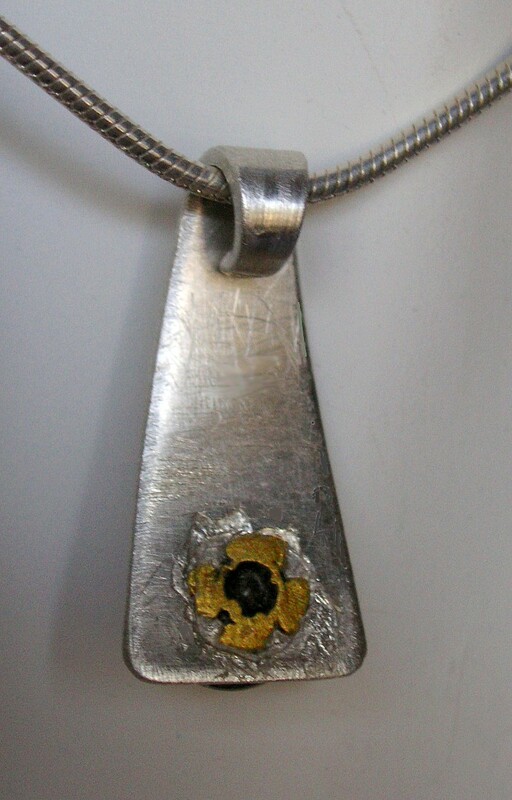 Then I did a little clean up, oxidized the pendant, and buffed it up with a satin finish. When possible, I try to keep the back clean and in the same style as the front – this shows the curve, the patina, and the clean solder of the bail. I only wish the silver heart was as cleanly soldered onto the copper as the bail! My Heart Belongs to..... Me? Well… this is not sell quality, but I love the look. So I’m not sure if it’s mine (feels a little strange giving myself a heart! ), or if I’ll gift it to a friend. 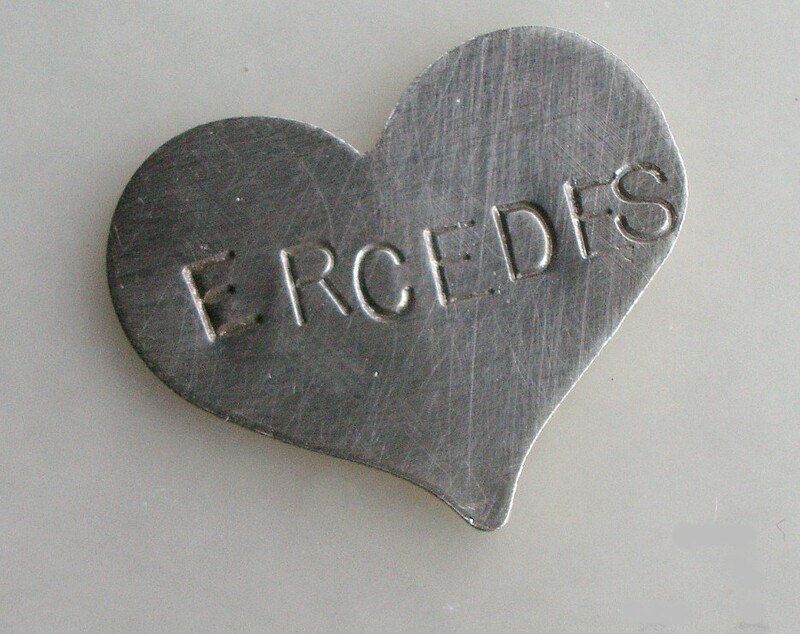 And lucky for me, I’ve got another mis-stamped silver heart in my recycle bin, so I can make another one, which I hope will come out a bit better!! 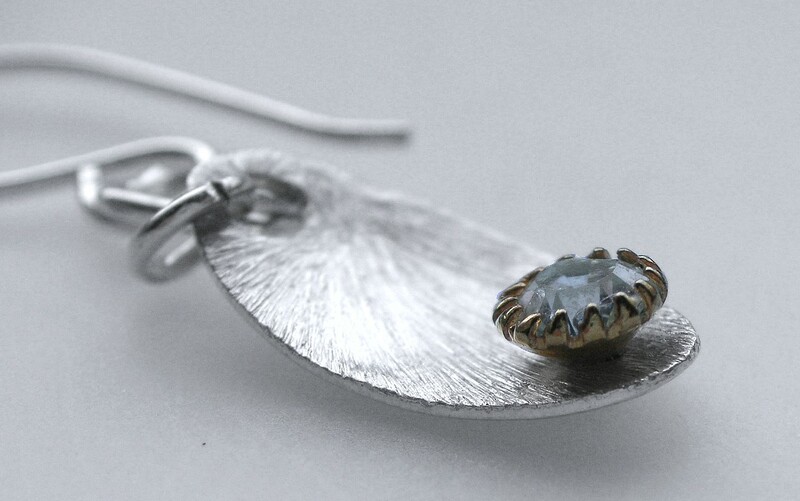 If you like to create mixed metal jewelry like I do, you’ll soon discover that oxidizing the pieces really give them some depth and enhance the texture. 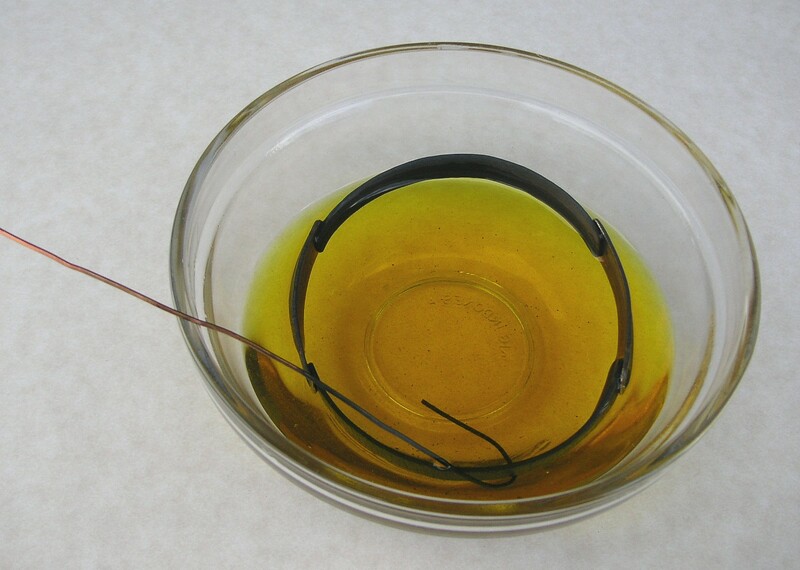 Last week I got an order for a a bangle bracelet that a customer liked, but needed made smaller, so I figured it would be a good time to write up a tutorial on how to use liver of sulpher (LOS) for oxidizing. LOS is great for creating an antiqued look on copper and silver – it works on brass too, but has a weaker affect. Here is the original bangle, oxidized and “aged” to a beautiful warm patina, shown with the “brand spaking new” bangle I just finished. 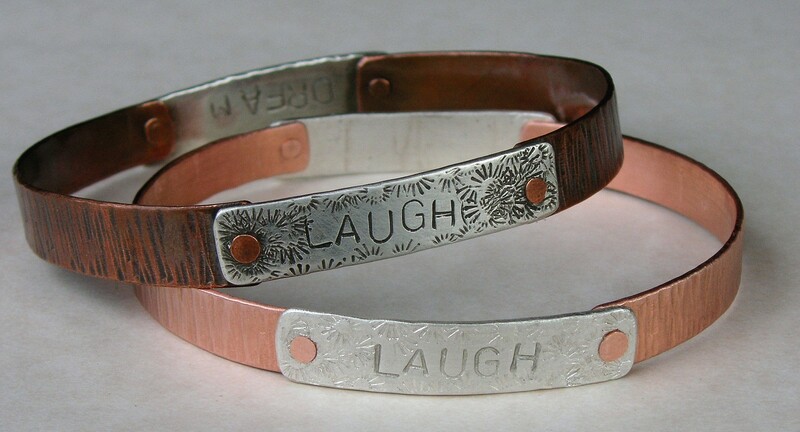 You can clearly see the difference in the finish – the oxidized bangle (top) has the detailed texture and stamping highlighted, whereas the new one I made doesn’t show the depth. I use the solid LOS – I’ve been using it for years, and I’m pretty used to it, but you can also buy liquid form and gel form, which is easier to use, but has a shorter life span. Solid LOS comes in rocks, and the container is cloudy to protect from direct light. It is very, very, very important to keep LOS stored in a way to keep moisture from getting into the container – moisture will make LOS useless. I always tighten my container, put it in a ziplock bag, and place that into a brown bag – protecting it from light, and moisture. To use, I take a small rock, and put it into a glass bowl, then add very hot water. 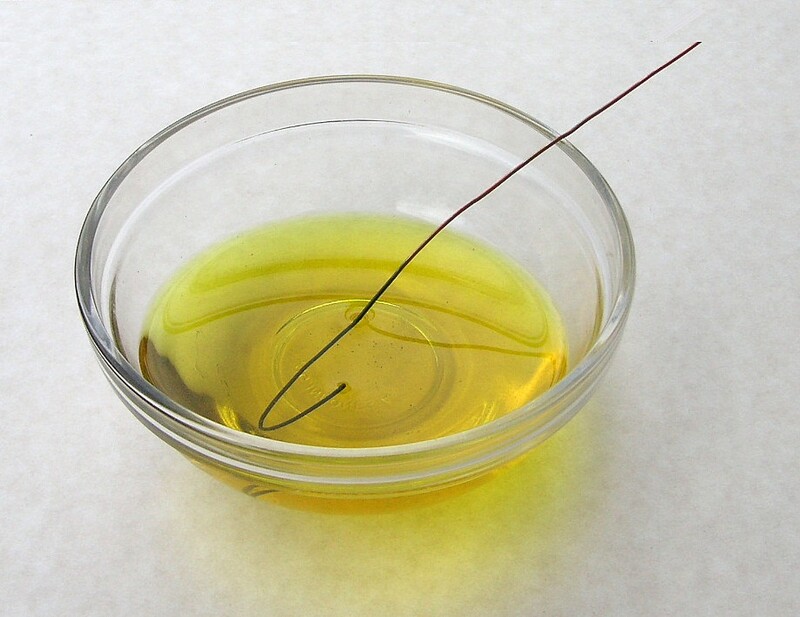 Make sure not to use a metal bowl or it will contaminate the solution, and mess up the bowl too! 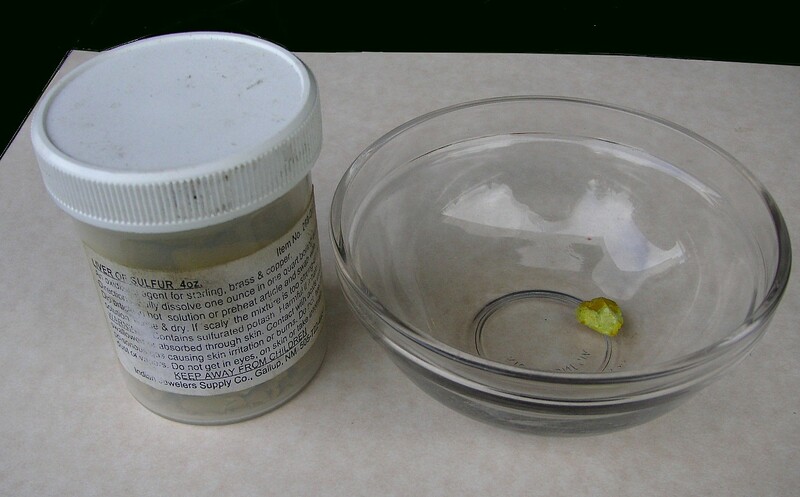 The LOS will dissolve in the hot water, becoming a greenish yellow color. Please note – LOS is a chemical – it STINKS like sulpher (duh…), and some folks are sensitive to it. I don’t have any issues, but I try to keep it off my skin, and use a piece of copper wire as a hook to dip items into the LOS. I just drop the bangle in, and very quickly, the bangle turns black. It only takes a few seconds (really!) to completely change the copper and silver. I always make sure that I use a copper hook, so I don’t need to fish it out with my fingers! Once I get the coverage I want, I remove the piece and rinse it in cold water. You want to be sure that you don’t leave it in the LOS too long, because if you “over” oxidize, the black will actually solidify, and flake off. The LOS will continue to work in heat, so it is important to rinse in cold water, and dry completely. Take it off, take it off, take it all off!! There are several different ways to remove the excess surface black. Basically, you need to gently scratch it off, to expose the surface underneath. These are the three products I used for this bangle: 3M Scotch-Bright green scrubbies (for some reson, generic scrubbies just don’t work! ), a fine sanding sponge block (you can get these from the hardware store), and 3M Crocus Cloth, which I get from jewelry suppliers. 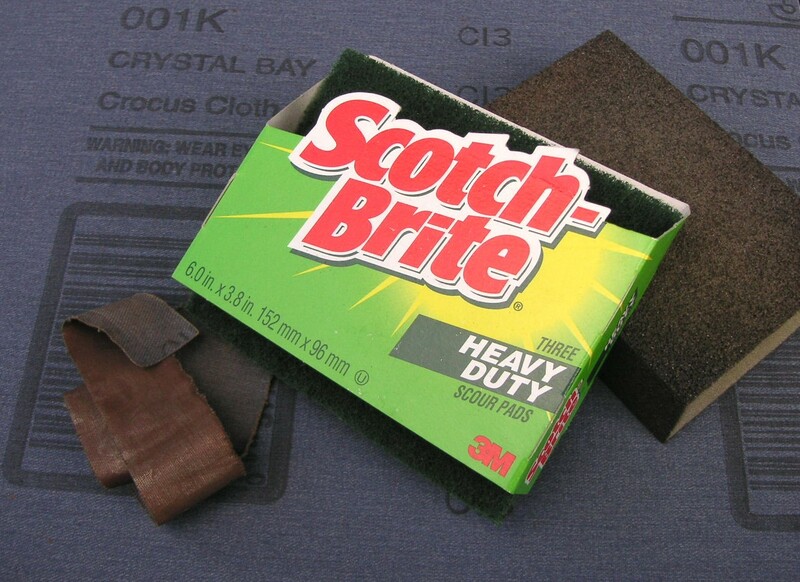 First I use the green scrubbie and rub it over the surface, getting as much black off as I can. The sanding block can be a bit scratchy on the surface, so make sure to practice using this on scrap metal to get used to it. I also use the green scrubbie to get the inside cleaned up, and then I use a strip of the crocus cloth to buff it up and soften any scratches. Crocus cloth is a denim material with a fine sandpaper paint on one side. It will dissolve and make a big mess if it gets wet, so make sure your piece is dry. Just like the other one! 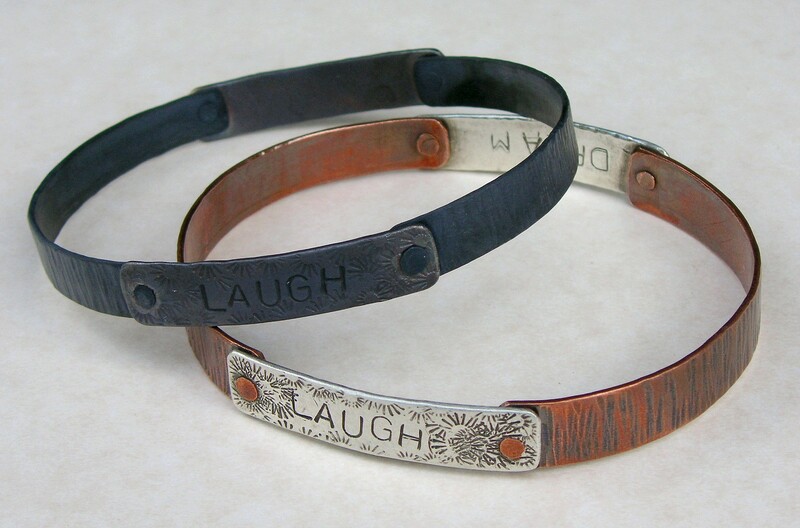 And here’s the final “twin bangles” – the original is on the bottom (you can see the word “DREAM” on the inside back), and the new one is up top. It is still a little bright – it will take a few days for the copper “pink” to age and take on a beautiful warm color. 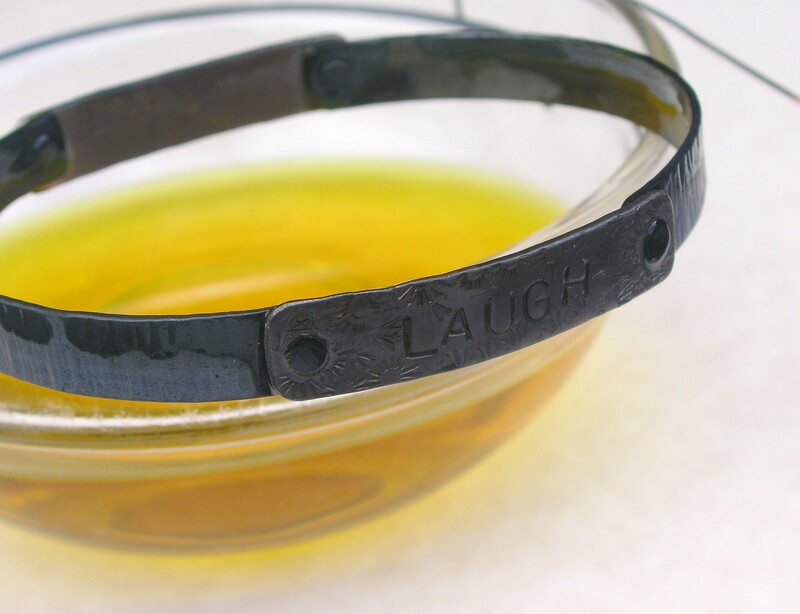 I will rub a little oil onto the surface, which protects the piece a bit, and adds to the patina. Over time, the new owner will need to occasionally rub the piece clean with a green scrubbie, because the copper will continue to oxidize naturally. I rarely make 2 items like this EXACTLY the same. I usually stamp a different phrase or texture, so this was a great chance to compare all the steps in the process with the final bangle. I hope this helped to show folks that using LOS is pretty easy, and the results are great! These are the basics that most people come up with. So I’m going to write a few posts explaining soldering in a “real” environment – mine! This first post will look at the tools you need, and later on, I’ll post more about the techniques and how-tos. Not as Much Space as You Thought! The tripod is great for raising your pieces to working level, the screen is both a working surface (useful when you want to torch the piece from underneath), as well as a shelf for the charcoal bloack. I like to solder on compressed charcoal, because it holds the heat from the flame, making it easier to get your piece to come to soldering temperature. As you can see – it can get pretty messy and ashy, but it still works fine. I occasionally rub the surface of the block to even out the surface and make it flat. This is really it – a torch, the fuel, solder/flux, something to solder on, tweezers to move and pick up the item as it heats up, and pickle to clean off the firescale. Another item that is handy (but not necessary!) is a 3rd hand, used to hold an item in position. 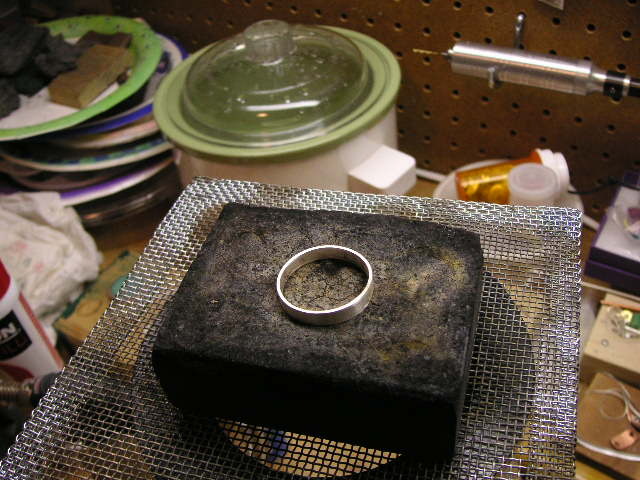 In this photo, the ring is being held firmly on a square of silver so it doesn’t shift when the torch is applied. Not as complicated as you thought…. and this set-up is perfectly fine to get started. 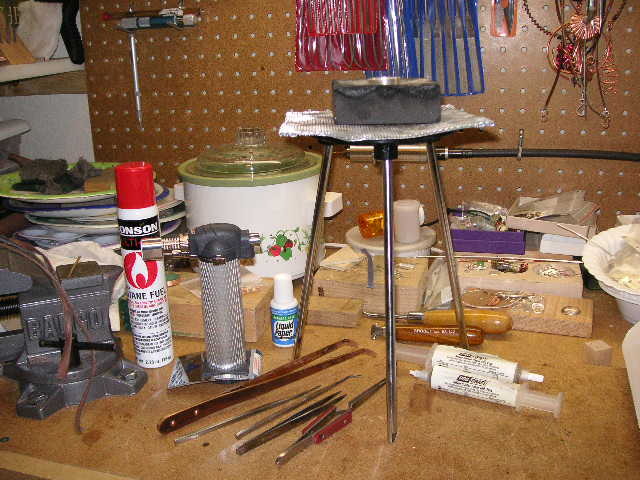 I have been soldering for many years, but my space is limited (a closet – remember! ), so I cannot have a more elaborate set-up. And this simple set-up is sufficient for almost all the work I want to do. In my next Soldering post, I’ll explain more about the tools and materials, and in future posts, I’ll show how to set up your projects for basic soldering techniques. 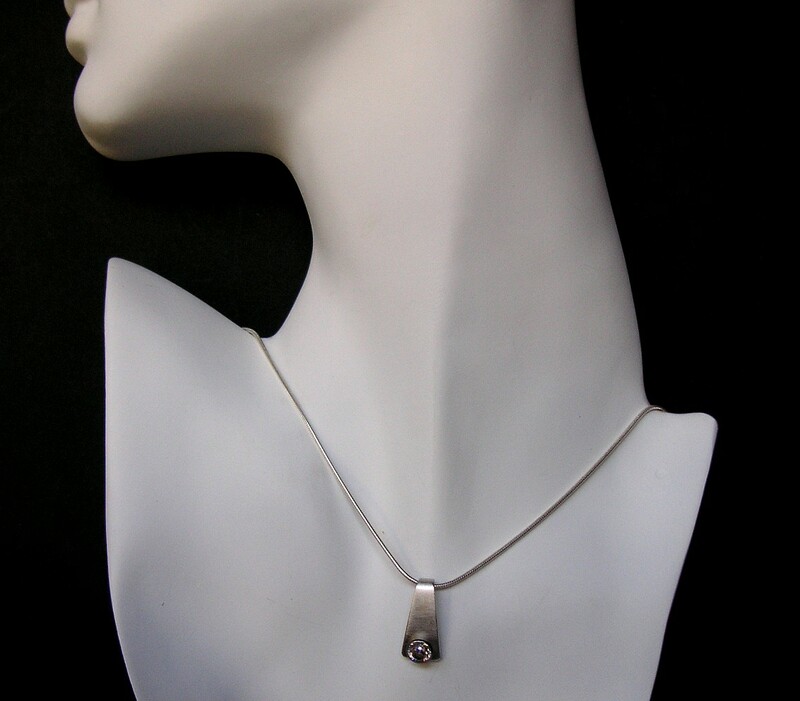 If you look at my jewelry, you’ll notice that my style leans toward natural, organic styles. 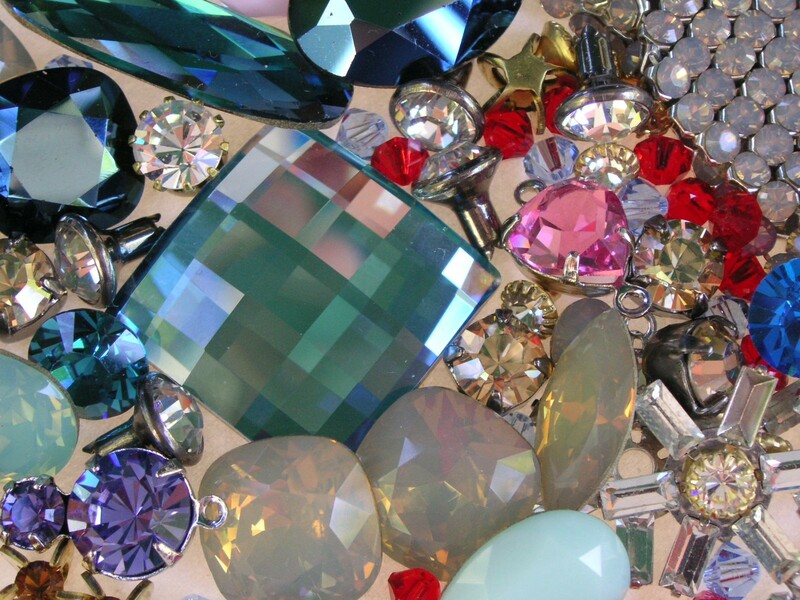 And even though most of my jewley just doesn’t work with them, it doesn’t stop me from wanting to play with sparkly shiny things! So last week at Hooked on Wire, I was just as excited as everyone else to see the presentation from the Swarovski rep, and check out all the new products coming out. There were various crystal items strewn all over the tables to keep us in our seats! And even more fun, at the end of the presentation, WE GOT TO SWEEP UP THE TABLES! Aren’t these just so cute!? These crystals are only 4mm each (less than 1/4 inch), but they have a really great shine. They are pre-set in small brass multi-prong rivet seats, which makes them easy to use… ok, not real easy, but since I’ve been riveting tubes for a few years, I guess my riveting skills were just fine! 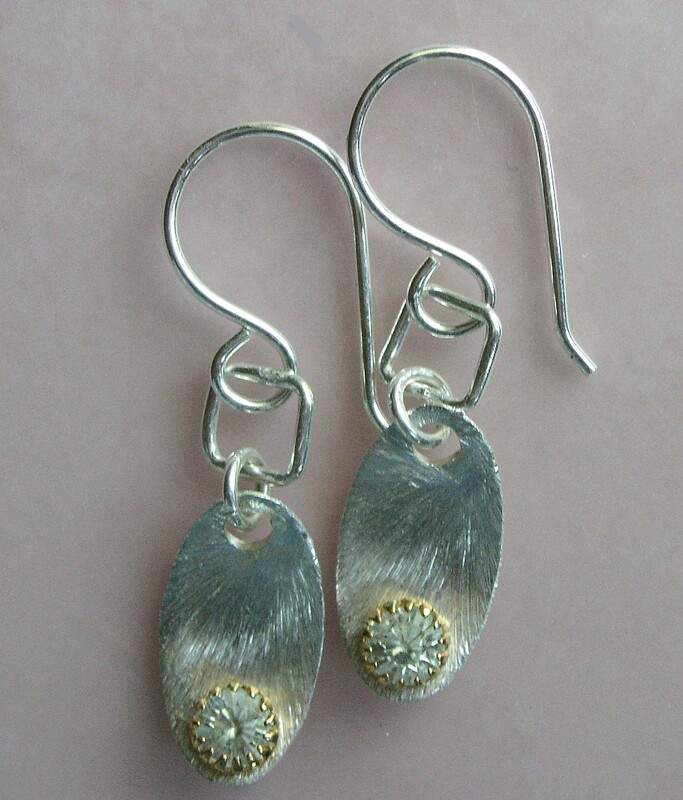 These look so cool from the side – the textured sterling petals (5/8 inch) are curved, creating a basin for the crystals. The brass seat has a cone shape, which holds the crystal up… I like that it gives it a more dimensional look. At this angle, you can see the bottom a little. The brass seat includes a short tube, which was set in a hole in the silver, and then flared to hold the crystal tight. 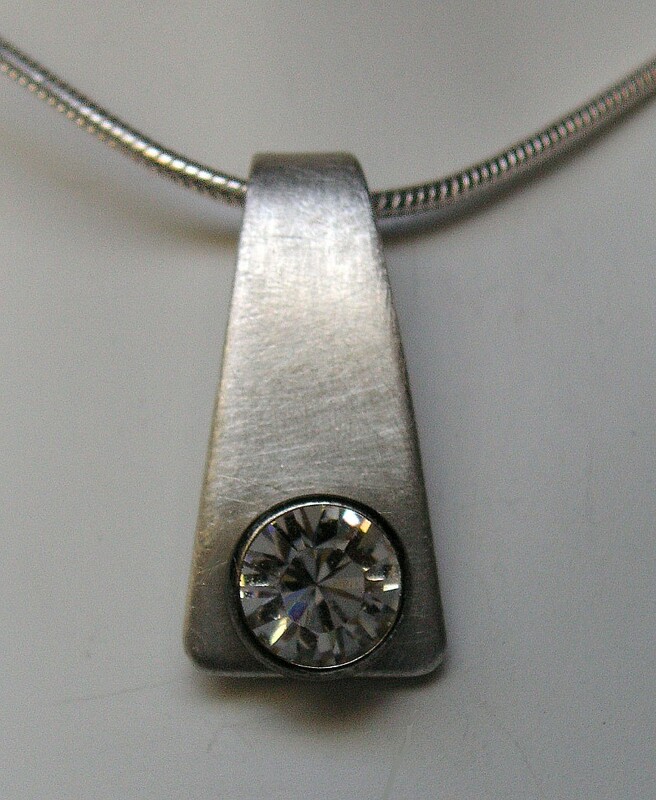 It’s a little tricky to flare the rivet without breaking the crystal, but I was able to get it done by going slow. The result is a very sweet pair of earrings. They measure less than an inch total, but they have a brilliant sparkle! 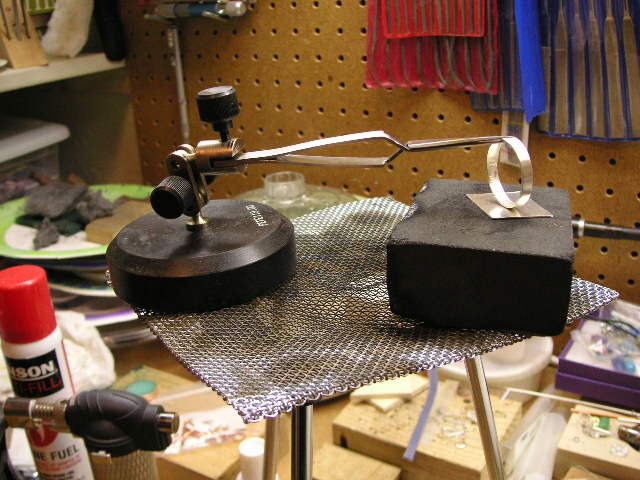 When you make a ring, it’s always a little tricky figuring out how much material you need. 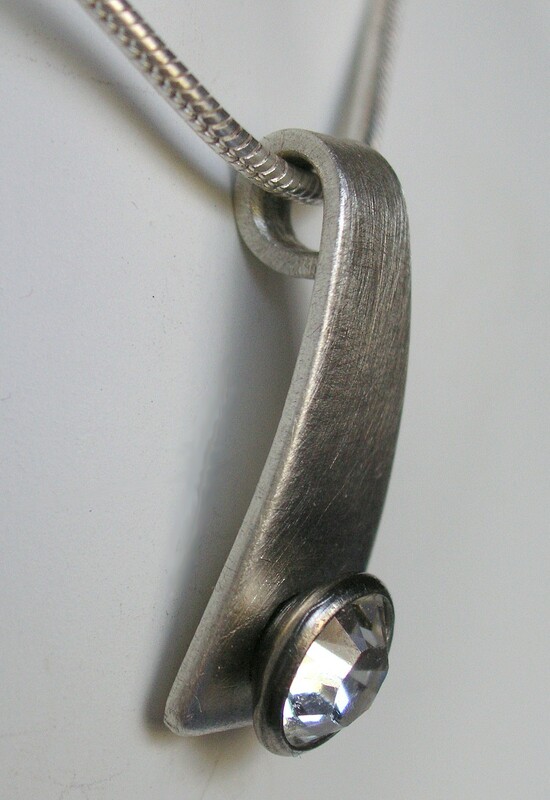 For some techniques, such as wire wrapping, or riveting, it’s easy… and you can always make small adjustments. 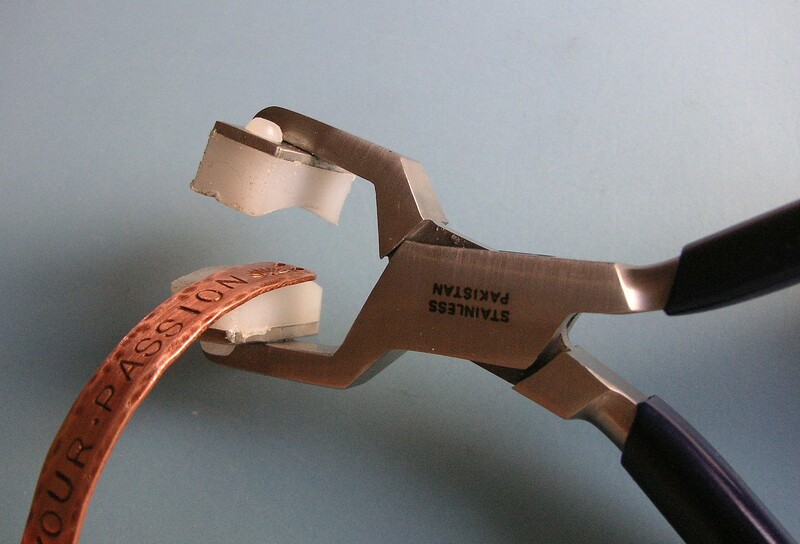 But when you’re making a soldered band, you need to know how long the strip should be. I will be teaching a rings class in a few weeks that requires being able to figure this out… that’s where math comes in! 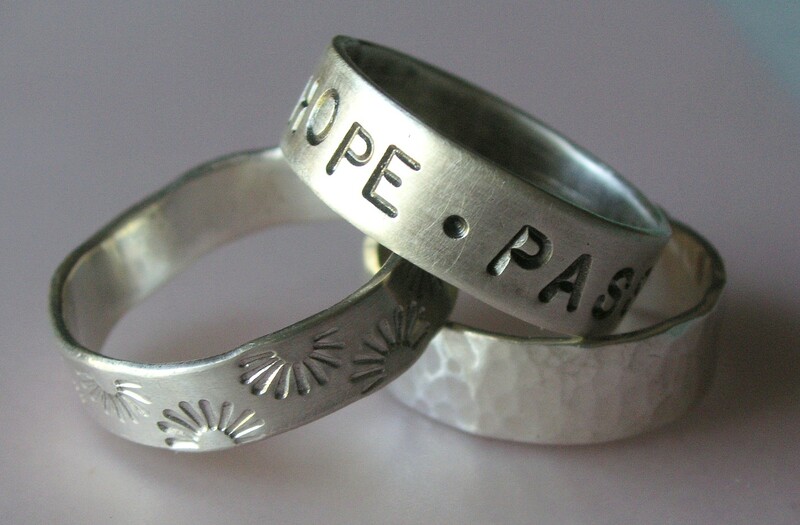 I love these rings… but then again, I love stamping and heavy metal!! It can be tempting to buy a prefabricated band and just stamp a pattern or message on them, but it is too easy to stretch the ring a bit when stamping. If you create the pattern on flat stock, then cut it to appropriate length and solder, you are guaranteed a good fit. And this is really really important when making a custom ring! The length of the stock metal sheet will vary, depending on how thick the metal is. A ring made with thicker gauge metal needs to be longer than one made with thinner gauge to accommodate for the matching of the cut ends. So what is the magic formula used?? Really, the formula is easy, and it’s not difficult to do – just cut metal a little longer (ie: 59mm) to get started, and stamp your design across the band. Re-measure and mark the metal to be as close as possible to 58mm (I always round up), then cut. file and sand the edges flush, so that when they meet, they do not have a gap. Fold the metal ends gently together, then solder and finish off as usual. Formula Works for All Band Styles! 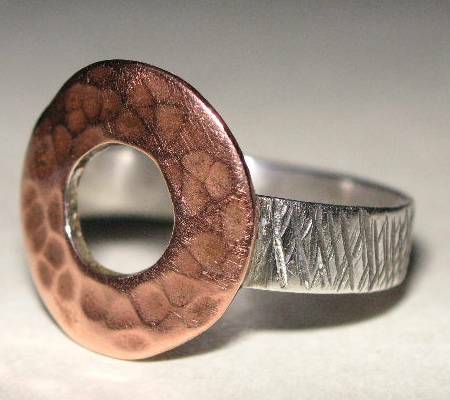 For this ring, a strip of silver was soldered to one end of the copper disc. The overall length was determined using the formula above, and then the measurement was marked on the metal, including the radius of the disc into the length – easy!! Or, if you prefer… you can always download a table online with the sizing already figured out!